What Day Of The Week Was April 17? 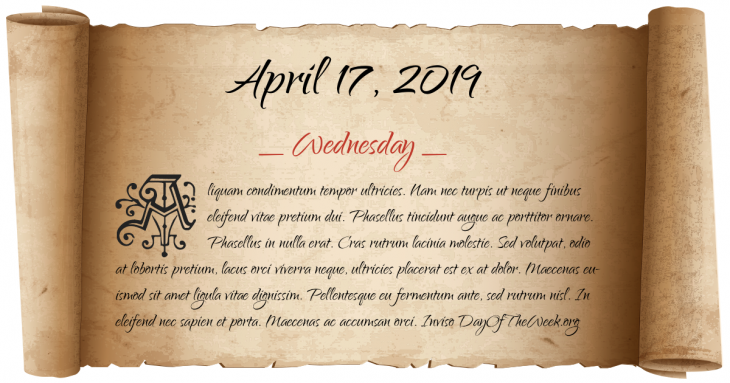 April 17, 2019 was the 107th day of the year 2019 in the Gregorian calendar. There were 258 days remaining until the end of the year. The day of the week was Wednesday. After the First Battle of Bedriacum, Vitellius becomes Roman Emperor. King of Denmark Harald III dies and is succeeded by Canute IV, who would later be the first Dane to be canonized. Forces of the Communist-controlled Greek People’s Liberation Army attack the smaller National and Social Liberation resistance group, which surrenders. Its leader Dimitrios Psarros is murdered. Czechoslovakian Communist Party chairman Alexander Dubček is deposed. Who were born on April 17?